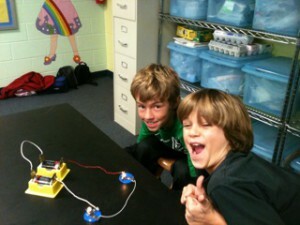 The St. Johns County science curriculum is developed in accordance with the Next Generation Sunshine State Standards. It is grouped under four science bodies of knowledge; nature of science, physical science, earth/space science and life science. The bodies of knowledge are further grouped under eighteen big ideas. Grade level benchmarks are then identified to be taught within each “big idea”. Every science body of knowledge, but not every big idea will be taught every year. For example, students in third grade will, “Investigate, observe, and explain that things that give off light often also give off heat.” This is a third grade benchmark for “Big Idea 11: Energy Transfer and Transformations,” contained within the physical science body of knowledge. Students in fifth grade will take the science FCAT which requires that students demonstrate proficiency in third, fourth and fifth grade science benchmarks. Science instruction is delivered in a variety of formats depending upon the structure of the school. A focus on inquiry will teach students to think scientifically. Hands on activities help students to see science in three dimensions in real time. Reading and writing about science are also vitally important tools in the effort to help students develop their understanding of science concepts. Science is always about observing and describing the natural world. Parental involvement is encouraged. Family activities as diverse as nature walks, growing a garden, playing ball together or cooking an evening meal can help students develop background knowledge that will facilitate the acquisition of important science concepts.